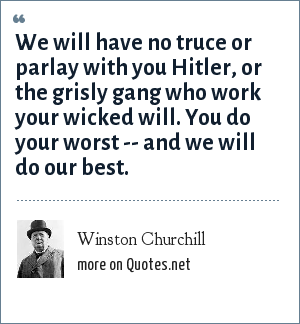 Winston Churchill: We will have no truce or parlay with you Hitler, or the grisly gang who work your wicked will. You do your worst -- and we will do our best. We will have no truce or parlay with you Hitler, or the grisly gang who work your wicked will. You do your worst -- and we will do our best. "Winston Churchill Quotes." Quotes.net. STANDS4 LLC, 2019. Web. 18 Apr. 2019. <https://www.quotes.net/quote/11939>.